Babies cry... a lot. In fact, babies cry the most when they are about six weeks old. Crying is the only way babies can tell us that something is wrong. There are many reasons why a baby might cry but luckily for parents the response is always the same – go to your baby and hold him. He can't soothe or comfort himself until he is at least six months old, so comforting your baby and helping him communicate with you is vital. Responding to your crying child teaches him that he can depend on you to care for him. He will learn to trust you. He will also learn how to soothe himself if you consistently respond to his cries. You cannot spoil your baby by responding to his cries. There are many different ways to soothe your baby but there is no one right way. You can try rocking, walking, singing or speaking quietly to your child. Maybe your baby is hungry, or has a soiled diaper. You could check that nothing is pinching him, or making him uncomfortable. He may want to stretch out or be swaddled tight. Sometimes babies just need to release pent up energy before sleeping. Listening to your child cry is hard. 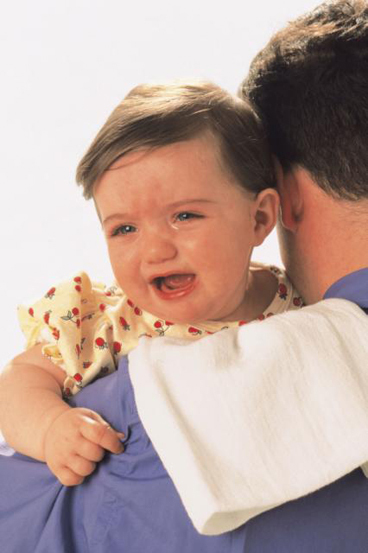 It is easy to feel overwhelmed or frustrated when your baby does not stop crying after you have tried to soothe him. It's okay to feel this way; every parent has felt this way at some point. The best thing to do when you are feeling frustrated and have tried to soothe your baby is to put your baby in a safe place (his crib or playpen) so you can leave the room for a few minutes. It is never okay to shake or harm your baby, no matter how frustrated you may be. Find out the advantages and disadvantages of using baby soothers. There are times when even the most experienced parent cannot soothe a baby's cries.